Have y'all seen this website that charts the popularity of names over the past 100 or so years? You just type the name you want to look up into the search bar and a graph pops up showing the popularity of that name over time. Holy addicting! 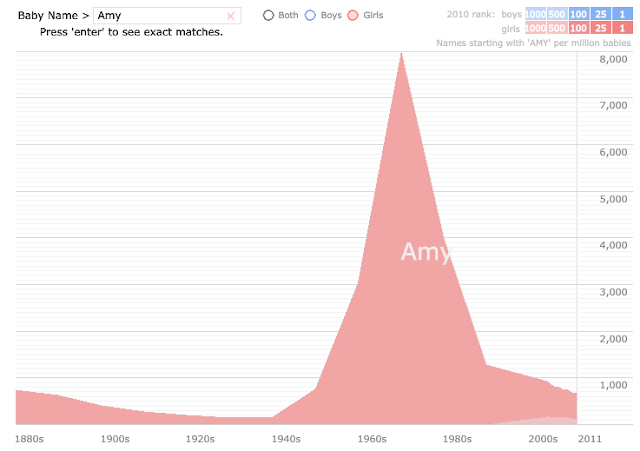 Apparently "Amy" peaked in the 70's. Guess that explains my teenage obsession with Dazed & Confused. Educational, entertaining, and faith-in-humanity-restoring (see below). When did your name peak? Even better, when did you peak? Just kidding don't wanna hear about your high school! Veronica is the #14 name in the Ukraine! Hoorrayy!